Chris Nickson reminds us that Leeds has been, and continues to be, a city of immigrants and multi faiths and that’s how we like it. When people arrive in a country, they don’t simply bring their hopes and dreams for the future. Many bring their faith. It’s part of who they are and what formed them, something that identifies them. Leeds has been a city of immigrants for more than two centuries. Just as an example, the first Jew here was mentioned in passing in the 1700s, and in 1786 the first Catholic mission was established over a blacksmith’s forge, next door to the Pack Horse on Briggate. But it’s also worth remembering that while Christianity probably arrived here between 600 and 700 CE, the old ways didn’t immediately vanish. Standing on the border between two early kingdoms, Leeds was a place of some importance. 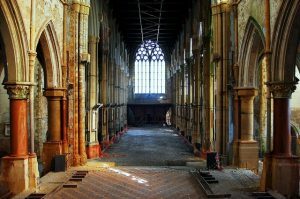 That was shown when pieces of five crosses were discovered while rebuilding the Parish Church in the 1830s. The five crosses might have been for preaching, or memorials to men long forgotten. But a panel on one shows an image of Wayland the Smith, a man whose legend predates Christianity in Leeds. Henry VIII and the advent of Protestantism might have sent those who kept to the Catholic faith underground, but it never died completely. In 1793 it was out in the open again, with a chapel on Lady Lane, soon followed by a school for girls, then one for boys. Irish immigration swelled the Catholic population of Leeds – by 1831 almost 4,000 had arrived, and St. Patrick’s Church was built on York Road, close to where many had settled on the Bank. That’s not to say there wasn’t lingering anti-Catholic feeling. When Catholic schoolchildren visited Kirkstall Abbey in 1852, someone began a rumour they were going to take possession of the place and a man attacked a priest. But Catholicism was here to stay. By 1838 there was a Catholic cathedral, St. Anne’s on Park Row, and in 1857 a mission run on the Bank became Mount St. Mary’s Church. Judaism also arrived properly in Leeds during the 19th century, with Gabriel Davis at its head. He was the man who persuaded Lord Cardigan to give land for the first local Jewish cemetery in Gildersome, and Davis’ daughter was the first Jewish bride in the town. 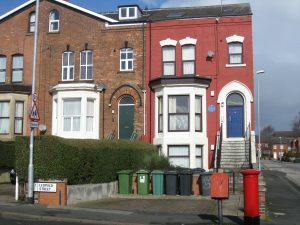 The few Leeds Jews had original worshipped in a room on Bridge Street, in the Leylands, then Back Rockingham Street – their rabbi also lived in the Leylands. It was 1860 when the first proper synagogue was built on Belgrave Street, then enlarged in 1877 to hold 700 people. The rush of Jewish immigration began in the 1880s as people fled Russian persecution, and soon there were several synagogues around the Leylands to cater to the populations from different countries – on New Briggate, Templar Street, Lady Lane – as more and more families swelled the numbers across the Leylands. A generation later, some would move up to Chapeltown, and then farther out – and the synagogues, of course, would move with them. Although the real influx of immigrants from South East Asia began in the 1950s, there was a presence in Leeds from the 1930s, both Sikhs and Muslims. The few who lived here, and their visitors, prayed in their homes. In the early 1950s, Gurmit Singh arrived and bought a house on Clarendon View where local Sikhs would worship on Sundays and soon organised a Baisakhi, a spring festival, held at the Civic Theatre (now Leeds City Museum). In 1957 a United Sikh Association was founded which also included Punjabi Hindus, and a year later the first gurdwara in Leeds opened at 3 Savile Road in Chapeltown. Within three years, the gurdwara moved to the old Congregational church farther up Chapeltown Road, where it remained for many years. 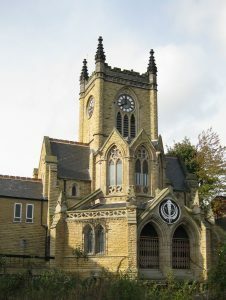 Shortly after came the first mosque in Leeds, an ordinary house at 21 Leopold Street in Chapeltown that had once been a synagogue, bought by donations raised among the local Muslim community. Called Jinnah (after Pakistan’s founder), it opened in 1961, serving 500 Leeds Muslims, and remained the centre of the community until the Islamic Centre opened around the corner 20 years later. What’s apparent is they way the religions all had humble beginnings here – very likely the first Parish church was a small wooden building. And things were repurposed – a church becomes a gurdwara, a synagogue turns into a mosque. In a city of immigrants – and if you go back far enough, we’re all immigrants – things change and flow. Nothing is static, and nor would we want it to be. With thanks to Religion in Leeds, edited by Alistair Mason. More information about multi faiths in the city and lifelong learning can be found at LCILeeds. Banner photo courtesy of Wikipedia, by Razorlax. Chris Nickson is the author of several historical crime novels set in Leeds. 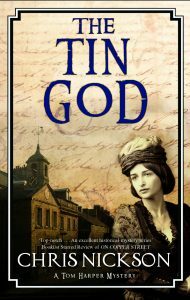 The Tin God is the long awaited sixth novel in the Tom Harper series. The Tin God can be ordered here. Previous story #UrbiWrite,The Urban Writing Retreat For You! Second Date Announced.